Minke whale (Balaenoptera acutorostrata) is one of the smallest baleen whales, growing up to around 9 m for males and 10 m for females. They can be easily distinguished from other whales by a white band on each flipper. 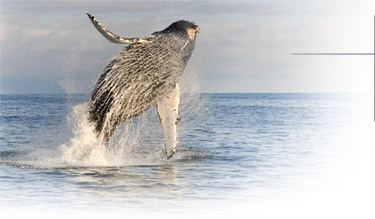 Minkes can swim up to 30 km/h. Normally, however, they swim just a few kilometers per hour. They feed on a variety of krill and other plankton. They also eat small fish, which include herring, cod, pollock, sardines, and others. Taking in a large gulp of water by expanding their mouths with 50 -70 ventral grooves, then spit the water back out between their baleen plates, while small hair-like fibers trap the krill or fish inside.